The Moon moves to Taurus at 4:18 am EST and is working with both Mercury and Pluto today. It's a great time to get focused and organized. Persistence is in the forecast, but a relaxed approach is possible. There shouldn't be much need to push. Things can come together with a bit of work and a willingness to let others know what you need and want. All of this energy is in the practical earth signs, so hands on, constructive approaches are best! Taurus Moon provides strong will for sticking with plans and decisions. It's good for anyone quitting something or trying to move forward in a goal oriented way. Tonight is friendly and favors friends and family over bigger events. It's also a decent night to work late on something you want to accomplish. Wear blue. The Moon is waning in Taurus, so it's a good time to get rid of things you're sure you don't want, including bad habits, harmful influences or outworn relationships. Today is good for setting your mind to something. Two squares in the zodiac lend stubborn persistence to the day. The Taurus Moon squares the Leo Sun. Two dynamic, strong energies are a force to be reckoned with! It makes compromise tough but not impossible. Go for the most creative, solid long term solutions only! Don't expect alot of flexibility, but do take advantage of plenty of strong will. Jupiter in Aries is square to Pluto indicating a need to act and decide, put the past behind even if it's not easy, and try to work through power struggles. Some important things are likely to come out of these squares if you have the drive to struggle through them! It's the 4th quarter Moon, so planning is important as we move toward a New Moon next week and Mercury retrograde on August 20th. Tonight some of us will feel tested. Some work is required. Socially keep things down to earth and free of drama. Wear lavender. The Moon is void of course from 8:45 am to 12:54 pm, and the heavens are a busy place today! In the morning hours try to stick with simplicity and routine and save bigger moves for the afternoon or night. Mars is engaged with both Pluto and Aries and selfish behavior will be an issue. Mars in Libra is striving for justice, so keep integrity and fairness in mind. The Gemini Moon that kicks in as the day goes on encourages us to think things out but without overanalyzing! Get physical workouts in to relieve mental stress! The brain may be working overtime! It's a good time for writing, marketing, advertising and networking. Tonight the Moon is in harmony with Mars in Libra and Jupiter in Aries for fun, socializing, and excellent chemistry between like minded people! Wear yellow. The Gemini Moon squares Mercury in Virgo. These two signs are both ruled by Mercury so there's an excess of nervous energy in the air! Do calming things today! We can be frenetically busy or anxious at times like this. It might be hard to communicate clearly or technical problems might get in the way. Be careful what you put in writing and make sure you say what you really mean. There's a need to solve problems and consider alternatives to the current state of things. Brainstorm ideas and try not to be overwhelmed! The Moon in Gemini and Sun in Leo like each other very much so it's a day and night for performances, meeting people, and having good times! Work through the tough stuff then get to the fun! It's a great night out. Leo, Gemini, Aquarius, and Libra are in their element. Virgo, career matters and responsibilities might seem like a burden but try to get fire and air sign perspectives. Cancer and Capricorn, communication is key! Wear gold. Gemini Moon until 5:50 pm, and today looks like a series of struggles or problems to be resolved. The Moon squares both Venus and Uranus and adjustments need to be made. That might be an understatement. Venus is relationship and partnership and Uranus is a rebel and breaks the norm. Best case scenario with these squares is big breakthroughs! No going back! If that's what you want, work for it today! There's lots of anxious, anticipatory energy in the air. Put things up for discussion and see if you can reach decisions. Trouble shooting is probably the key phrase of the day. Yet some of this, with Uranus involved, will feel out of our control. It's our reactions that count. The Moon moves to Cancer at 5:50 with only a short half hour void of course before then. The challenging squares continue tonight and add an opposition to Pluto and Venus moving to Libra and it's wildly unpredictable. Surround yourself with trusted friends and don't take unnecessary risks. Familiar and easygoing is good. Wear black. The Moon is in Cancer and will start a long void of course at 2:46 pm. Do anything important from purchases to decision making before then! At 2:46 pm consider a little vacation until Sunday night or beyond! Relax, cook family dinners, bake cakes (it's a Cancer thing! ), and enjoy time at home or in familiar surroundings. Venus just moved to Libra and is opposite Uranus creating big stirs in love an relationship. New is more in favor than old and in long term relationships things might need some refreshing or changing up. Sometimes there has to be a big upheaval before things settle down under these circumstances. Libra and Aries experience this most directly and Gemini and Sagittarius, this hits your sectors of romantic love, frienships and hopes. This weekend could be a wild ride! Wear blue. Venus and Saturn meet which can mean serious things as far as couples and other partnerships go. Knowing where to draw the line is important and there's no room for emotional drama or other imbalances. Things need to be fair and equal or nothing. The Moon is in harmony with Saturn, Venus and Uranus after moving into Leo at 7:23 pm. If the day is in any way stressful or you must deal with unwanted obligations or people, the evening should feel a bit clearer. The Leo Moon encourages good times for the next couple of days! Wear purple. Today might feel a little wacky with Mercury opposite Neptune and Saturn opposite Uranus. It might be hard to determine which end is up! The Aquarius Moon was Full last night and lots of changes and news continue to develop! Have vision and try to ride the waves! Leo and Aquarius, Mercury opposite Neptune energizes your relationships and sparks romance and other chemistry! However make sure you're saying what you really mean and avoid misunderstandings! Aries and Libra, you might feel more chaotic and rattled. The pressure is on and you may want to get out of a "hot kitchen". The Sun in Leo and Jupiter in Aries are very optimistic for new endeavors and favor the fire signs most! Sagittarius, you may like this as much as your Leo and Aries friends and collaborators! Gemini is in an expressive mood today and while Mercury and the Sun are in Leo! We might not believe what we hear come out of some people's mouths today, but it could be entertaining! Try to act with honesty and integrity! Tonight, act on an impulse if you're feeling lucky! Wear turquoise today. Mercury moves to Virgo today, and the Moon meets Neptune in Aquarius. All of this can confuse communication and create a "foggy" atmosphere. That's nice if romance is involved, but it's not great if you're trying to make a practical, informed decision or do business. The more you can keep today relaxed and free of long term implications, the better! When Mercury changes signs, it's best not to make a big decision.Information and perspective changes in the days ahead! Neptune and the Moon combine for creativity, vision, and a dreamy atmosphere. Friendship and the dynamic between us is enhanced, but don't ask for commitments or expect the whole truth and nothing but! The air and fire signs like this for social plans, dates, and love lives in general. That's Aries, Gemini, Leo, Libra, Aquarius and Sagittarius. Tonight is a great night for music, film or some other kind of escape from the usual! Wear blue. The Moon is void of course from 11:47 pm Tuesday to 4 am EST. The overnight, or those hours in your time zone, are spacey and may seem strange or confusing. Keep your wits about you. The Pisces Moon is opposite Mercury in Virgo today, and the tendency is to be critical or overstep boundaries. In truth, a laid back approach is called for, but do have clear limits and boundaries in situations where you need them! The Moon works with Pluto and we draw upon our reserves of emotional or creative energy. It might be hard to harness energy and motivate, but it can be done, step by step. Try not to be overwhelmed before you begin! The Pisces Moon helps us empathize with others and helping out is favored but doing things FOR other people is not as good as showing, collaborating or pitching in! Taurus, you may realize your limits with a friend! Scorpio, it's a good day for you to be on vacation or have a "field trip"! Tonight is more about close friends than bigger gatherings. Wear green. Mars moves to Libra, an interesting spot for the warrior planet! Libra is about peace and balance. Mars will meet Saturn on Saturday and oppose planets in Aries in the next few days. Justice is the goal and me first versus we, together, is one of the issues or challenges. In the wake of a Sunday Full Moon, partnership challenges and reevaluations are ongoing and further fueled by this Libra activity! The Moon is in Pisces. Keep very good boundaries. Show compassion. The danger is getting sucked into drama that is not your own. Know your limits and stick to them! The Moon is opposite Venus in Virgo and there are lots of conflicting pulls and energies in the air today and tonight too! Flexibility helps. Take a fair, reasonable approach. Arts and musical events are favored and the creative energy is flowing. Wear pink. The Moon is in Pisces void of course until 4:42 pm EST, and the heavens are full of oppositions! This does increase the chance we find ourselves in conflict and the need for compromise is strong. It's equally strong to just go your own way and not engage in situations that seem futile or negative. Try to put off decisions and lay low today until at least 4:42 pm. The Moon moves to Aries then. Let's focus on the good stuff! Mercury aligns with Pluto in the earth signs favoring practical problem solving. Virgo and Capricorn, you host this action. Tonight the Moon meets Jupiter in Aries for new starts, high energy and potentially good fortune! Sagittarius, Gemini and Leo enjoy this along with Aries! Wear red. Mars meets Saturn in Libra. This is an intense conjunction between the warrior planet and the planet of structure and challenge. In Libra, the big ideas are justice, fairness and balance especially between partners, and legal matters. It's time to take a look at what's unjust or one sided and try to make things right. This meeting is not your usual, everyday astrological action and it may seem serious or just plain difficult. The effects last far beyond today. On the upside, the Moon and Sun energize us in Aries and Leo, lending some optimism and encouraging fun and good times for those of us not in the midst of the upheaval. Those of us who can support and give good advice may need to be available and give out some positivity! Wear yellow. The Moon is in Aries in harmony with Neptune in Aquarius. Friendship and new alliances make today enjoyable. It's not a great day for serious business, but a day of fun and games. Imagination is inspired. The Moon is void of course at 11:55 pm EST. Wear orange. The Scorpio Moon aligns with Venus in Virgo. Attention to the fine points and details and a creative edge is in the forecast. Get creative with things that could otherwise be mundane. Doing skilled work, making things more beautiful, or even getting creative with finances is favored! The Scorpio Moon is buoyed by Venus, feeling lighter than some other Scorpio Moon times. Dealing with relationships can be easier. If you're in love, especially new love, the connection is very strong especially for Taurus and anyone with strong Scorpio or Virgo influence in their chart. In our work lives, the Scorpio Moon provides focus. It's looking like a pretty good Monday. The Moon is square to Mercury in Leo tonight. This can make it hard to make decisions, particularly with strong personalities involved. However, the creative tension can produce great things if you put lots of effort in and have patience with each other. If you have social plans tonight, you may notice people are a little bit moody. Sagittarius might need happy, fun friends to pull him or her out of a mood. Scorpio and Cancer are likely to want company. Leo, there could be a bit of tension at home, but it's nothing you can't manage. Wear maroon. The Moon is in Scorpio until 7:48 pm EST. If you need to focus and finish up something, close the door and shut out distractions! The Moon is energized by both Mars and the Sun for taking action and making solid moves. It's a good day to work on either personal or business interests. Neptune is the only planet that could mix things up a bit, with half truths or secrets. It might be hard to tell if someone is being honest. Don't blindly follow. Tonight the Moon in Sagittarius and Uranus in Aries fire things up with surprises, adventures, and new experiences! Fire signs and air signs are all systems go! Leo and Gemini won't be able to resist a night out, and Aries and Sag make perfect companions if you're in an adventurous mood. Wear purple. Today is about movement! No slouching or procrastinating! Saturn moves back into Libra after months of retrograde and then more Virgo time. Saturn in Libra is discerning, has good and balanced judgment, and urges us to do the fair thing. This may impact Libra most, along with those near or in Saturn return time (age 28/9 to 30 in particular). It's an outer planet so the influence is more long acting and not just about now. You may find yourself revisiting some things from last fall or winter now. Consider this a chance to make different decisions or move on. Virgo, you may be relieved to see Saturn leave your sign! This planet can be quite a challenge! Sagittarius Moon pushes for action and fun today, but there's also a philosophical influence in the air with the Moon trine to Jupiter in Aries. We're still urged toward the new over anything old or past its time. Try something on for size! No commitments are necessary, just play with ideas and go with the flow. Tonight the Moon is a little bit out of sorts with Venus, and what's most likely is one friend or partner wanting to venture into new territory or desiring more freedom while the other wants to hold back. Try not to be too critical and give each other space. Wear red. The Moon is in Sagittarius in harmony with Venus in Leo. Both are fire signs, craving excitement and activity. Networking, travel and social plans are favored. Take a field trip or do something fun. Plan good times with friends and meet new people too. It's also a good day to learn and try something new. The Full Moon warm up is on by tonight, and the Sun moves to Leo at 6:21 pm EST. Mars is in a confrontational spot in Virgo. If you don't have work done you'll be hearing about it. Though we are also likely to battle with ourselves over imperfections. Try to take it easy. Cancer, gifts or other good things are likely to come your way! Aries, Gemini, Sagittarius, Libra and Leo, you're totally in your element. It's the beginning of Leo birthdays. Wear gold. The Moon moves to Capricorn at 4:38 am EST, and it's a very busy day in the zodiac. The Sun, newly in Leo, connects with Uranus in Aries which is nothing less than combustible! We're close to the Full Moon so reverberation (feedback possibly!) from last month's lunar eclipse is in the air! This means change, upheaval, and also progress if you can let it happen! Go forward not back now before Mercury retrograde starts its' impact in mid August! The Moon meets Pluto for potential resolution of emotional issues, and since this is in Capricorn, take an orderly approach. Scorpio, this implies communication in both (or either) your personal and professional life. Capricorn, you are right if it seems like one thing after another in your world. Ease into things, but don't fight the current. Cancer, relationship things are up for discussion again. Tonight it might be hard to get in exactly that right mood to party or even relax! If you do go out take it easy with the Full Moon making some of us edgy or anxious. Saturday may be the better night if you are choosing one or the other for plans. Wear black. The Moon is in Capricorn, nearly Full. Jupiter is square to Pluto in Capricorn, and power struggles can be the result! The whole idea is to make progress, but traditional versus new and improved points of view square off! Business will be difficult but not impossible to negotiate. In personal relationships, Venus is more easygoing in harmony with the Capricorn Moon. Couples making practical plans and decisions are favored. It's also nice for social plans especially for Pisces, Virgo, and Taurus. Tonight we're in the Full Moon zone for sure. It's exact at 9:37 pm EST Sunday night. Keep a clear head. The effects of last month's late June eclipse vibrate again, and can range widely! Capricorn and Cancer this affects you most directly, however with a Full Moon in Aquarius coming, Leo and Aquarius are also feeling the tide come in! Wear green. The Moon is void of course in Capricorn from 10:20 am to 3:38 pm EST. It's a good time to lay low, take it easy, do routine work, or goof off completely. Don't take on major decisions yet! The Moon is Full in Aquarius tonight. It's the sign that brings us together, in groups we belong to and in our "communities" whatever type they might be. Like minded people can really connect strongly around a cause, a commitment, or even for friendship with this Full Moon. The Moon in harmony with Jupiter and Uranus in Aries shines light on all that is new, and in the wake of last month's lunar eclipse, moving ahead (not back) is the idea! In some cases we may feel there is no choice and in others, we should make decisions in our best interests and the interests of a lrger group as well. Trying to hold onto things the way they were is like fighting the current! 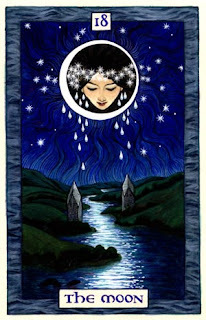 Tonight's Full Moon has beautiful aspects compared to June's Capricorn Moon and the harder angles that accompanied it. Enjoy good things! From the company you keep to the prosperity you've created to the open mindedness and joy of friends! Wear white. This article by astrologer Amy Herring might be of special interest if you have kids between 7 and 21 years old or if you are in your late twenties and getting into Saturn return time. Thought it was worth reposting. Solar eclipses explode with the energy of New Moons, propelling us forward, drawing upon the fire of the Sun! Leo properties are activated and may include changes in relationships or circumstances with fathers or other male figures in our lives. In tarot, the qualities of Sun and Strength characterize solar eclipse activity. Strength manifests if you're wrestling the beast that once again rears it's head. Trying to master or gain control over a recurring pattern, trait, or enemy is the theme of Strength. The Sun, in contrast, is about good times and self expression. A well aspected solar eclipse might trigger some child-like joy and get you out of a boring rut. This solar eclipse is also fed by fiery Mars, so inactivity is not an option! Get ready to move on things. However this eclipse differs as it occurs in the Moon's home sign Cancer. Yes, this month it's really all about the Moon. Your Moon sign is your sub-concious, intuition, child like side, dreams and desires. 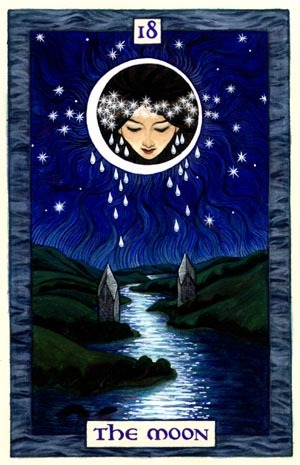 The Moon can also represent fears, anxieties, confusion, and latent traits. Sometimes it's the side of yourself you keep hidden. The things you don't say, the ideas you express through your art, music or poetry, the connections you feel with "the other side" and your ancestors. Sometimes the Moon represents parts of yourself you're not even really aware of, the themes that surface only in dreams. This particular solar eclipse in Cancer pushes forth all the the qualities of the Moon! Feelings, instincts, and our most psychic selves activate! It will become impossible to ignore those deep undercurrents you try to push down, as if to keep them underwater. Eclipses can be very unsettling since they push for change. Let that happen naturally. Don't fight the currents. Cancer eclipses are connected to our families and homes. Dealing with family issues will be common this summer, and the pull toward childhood homes and people and places from the past could be undeniable (whether by choice or by circumstantial events). Be "in" or "with" the Moon in the weeks ahead. Let yourself sleep and dream, express through art, and expect that you may feel very sensitive to situations and the environment around you. Make your home feel comfortable or search for a new one now! Fighting changes brought on by eclipses only means revisiting them later. Mars in Virgo favors a practical, pro-active attitude instead! The Moon is void of course from 7:48 am to 8:53 and then in optimistic, fun seeking Leo for two whole days. All the Moon's planetary action indicates an easygoing day. The Leo Moon works with Uranus in Aries for newness and surprises. Let go of control and expectations to enjoy this most! The Moon/Jupiter action is adventurous, open minded and favors expansion and good times! Both of those planets are in Aries, the first sign, and first tries, new experiences and beginner's luck are in the air! Sagittarius will be in a "go for it" sort of mood, and Gemini will make new friends quickly and easily. Tonight the Moon and Mercury meet for a very outgoing, expressive attitude. This happens in Leo, so Leo is the center of attention, but Cancer is favored for new work and in money matters. Libra, surround yourself with Leos and other fun people tonight! There are still lots of adjustments and a-ha moments happening as a result of that eclipse. Keeping an optimistic, action oriented attitude is the best plan! Be assertive today. Wear gold. The Leo Moon sails smoothly with no interruptions or obstacles! Leo is about children, learning, creativity, and fun! Mercury is also in Leo reminding us to show and develop our talents! It's a great time to take up an instrument, sport, or craft. Mercury in Leo is also expressive and acts and speaks from the heart. Leo is good at this anyway, but particularly right now. Gemini, it's a good time for you to write, draw up a contract, or send invitations. Aquarius, communication in your long term partnerships in both love and business is very important this month. Venus in Virgo is in harmony with Pluto in Capricorn and there will be lots of negotiating between partners. Taking a practical, realistic stance is favored. Virgo, as you host Venus, be gracious and fair. You may find yourself needing extra tactfulness in complex situations. Cancer, remember that this is a time of change as a result of the eclipse. Don't lose sight of what you want or be distracted from your goals. Tonight is free and clear for fun and games. Wear purple. The Moon moves from Leo to Virgo at 9:15 am after approximately 3 void of course hours early on. Between 6 and 9 allow yourself a slow, easy transition time if possible. At least, put off any promises. The Moon opposite Neptune puts us in a fog and makes the truth elusive this morning. Don't be overly trusting. The Moon works with Pluto for a continuation of reality checks in relationships and partnerships. Also double check facts and data before decisions today. In the evening, the Moon meets Venus which is good for getting along and favors romance and friendship for Scorpio, Virgo, Pisces, and Taurus. This also includes those with those Moon signs since the Moon often draws us to those we connect with most! Wear navy blue. The Virgo Moon met Venus last night and connects with Mars today! This indicates, for one thing, an eventful time in relationships. With the eclipses propelling us, many will make relationship changes and have important realizations now. Virgo is a mutable sign so a go with the flow attitude is good, but today is also about being pro-active, not passive. Virgo should feel energized to take action in relationships that need direction, an ending or beginning. The Moon also harmonizes with the Sun in Cancer for a caring attitude without being a pushover. Finding that middle ground between understanding and drawing the line is in the forecast. Pisces, Cancer, Virgo and Capricorn are likely to be feeling this. Aries, motivation for work and work-outs is likely for you and routine may feel really good. Today and tonight, aim for decisive moves, practical and productive steps, and a relaxed but focused approach. It's not a bad night out, but it might make more sense to get work done. Wear black. The Moon meets Saturn in Virgo for a strong reminder about responsibilities this morning. Put business first along with a health conscious attitude. The Moon is void of course for only about half an hour from 9:46 to 10:24 am and shifts to Libra then. Two oppositions and a square indicate plenty to be worked on and figured out. A fair, balanced approach including equal time and division of labor will be helpful. Being at odds will not be uncommon, and Libra and Aries are in the midst of that action. Capricorn, deal with your career and the roles you must play or obligation you must fulfill. It's a bit serious and potentially stressful for a Friday. 100% effort and willingness to compromise will yield the best outcomes.Wear lavender. The Libra Moon is in harmony with Mercury in Leo. Festivities are well timed! We'll want to relax, meet people, connect with friends and have fun! Both signs enjoy clothing and other adornments so it's a good day to shop, make-up or dress to stand out! Do something nice for yourself, and do accept invitations! Best friends, couples and other twos are favored. Don't be a third wheel if you can help it. It's a great date night! Wear pink. The Moon and Neptune start us in a foggy or romantic mood. Forgetting about problems for a while is likely this morning. Take a slow, easygoing approach to the day and avoid big decisions. The Moon is void of course from 10:26 am to 1:42 pm then moves on to Scorpio. We might obsess more or feel anxious as the day goes on. Old problems resurface and things are likely to weigh heavily on our minds as the Moon and Pluto align. Leaving the past in the past is the best idea right now. We're meant to be moving forward not backwards as a result of the New Moon last Sunday and the recent eclipses. Scorpio Moon time can pull us down. Try to channel that emotion into friendship, love or creativity. Avoid dwelling on things that haven't worked out, and move ahead with focus. Wear indigo blue. On the US holiday, the Moon remains in Aries in harmony with Venus. This bodes well for relationships, especially new ones, and for Aries and Leo especially. If anything important is up for discussion however, a square between the Moon and Mercury in Cancer makes agreement challenging. The traditional versus the new compete for attention or adoption. Dealing with family problems or issues is also in the forecast. It may be helpful or ward off arguements if we can attend to some details and appease a family trasition, for example. The Moon is void of course from 5:24 to 8:29 pm EST, and then shifts to Taurus. The night is meant to be relaxing and problem free. It's best not to have to work or take on anything too serious as the Moon works with Neptune favoring romance and friendship most! If the weekend's been a whirlwind or too much of a party the Taurus Moon brings us back to earth and favors routine later tonight. Wear yellow. The Moon is in Taurus which is great if you have to get back to routine. It's also nice for outdoor work and other vacation like activities too. Mixing practical tasks with fun is perfect today. The Moon aligns with Pluto in Capricorn reminding us of realities and work that needs to be done. Try not to procrastinate today. Any kind of building, construction and hands on work is favored. The Moon is waning so it's also a good time to get rid of what you don't need or break a bad habit and stick to it with Taurus resolve! Taurus rules the throat, neck and voice so work the vocal chords, sing and improvise for fun. And take care of any throat irritation with soothing teas and other remedies. Wear a neck adornment for attraction or good luck. Tonight is down to earth. Comfort zone is the place to be. Wear green. The Moon is in Taurus with mostly harmonious aspects to the Sun and planets. Today should be easygoing. Work persistently for something you want since Taurus has power, stamina and resolve for long term results. The Moon and Sun in Taurus/Cancer bring out a nurturing, protective side with the people we care about. Capricorn and Pisces, time with children may be important. Scorpio, your partner or someone close may need some t.l.c from you today. The Moon and Mars in Virgo activate physical energy, and today is a good time to adopt a workout plan or leave an unhealthy habit behind. Planning is also part of today. Get organized with schedules, pull out a calendar and fill in important dates, and make plans for the extended period ahead. Mercury retrograde starts August 20th and you want to schedule with that in mind! Cancer, Mercury in your sign makes this particularly true for you this month. Tonight the Moon and Venus square off in fixed signs Taurus and Leo. It's bull headed, but also dynamic combination if you can work with two strong, stubborn energies. Be willing to work through things with creative partners or in relationships where you don't see the world the same way. The results are likely to be better than what either of you could achieve individually. Socially, it's a good night to be with close friends rather than at big gatherings. Romantic entanglements may feel complicated by two squares involving the Moon, Venus and Neptune. This happens in the fixed signs so Aquarius, Taurus, Leo and Scorpio may feel it most. Wear pink. The Taurus Moon and Saturn work together overnight for structure, building, and even deconstructing. Take a methodical approach since we'll be rebuilding after the weekend's solar eclipse and New Moon. In other words keep all the parts, literally or otherwise, since you may need them to work in a new form next week. The Moon changes signs at 3:51 am, and Gemini Moon time leads us toward the next eclipse on Saturday. Think of Gemini as being light and like the wind. Air out confusion, clear out things you don't need, and be ready to blow out of situations that no longer work in your life. Change is in the atmosphere today, and this is just a precursor to Sunday's eclipse. Hints of that come today for signs like Aries and Gemini who may initiate things now, and Cancer and Capricorn who are in the thick of the eclipse activity again this summer. Tonight Venus and Neptune oppose in Leo and Aquarius, and those two signs are magnetic! Leo and Aquarius, create your ideal scenario and ask for exactly what you want! Aries and Libra enjoy this socially! Wear light blue. The Moon is in Gemini and Mercury moves to Leo today. On the days when Mercury changes signs it can be best to stay put and see how things shake out. Information and decisions tend to shift, affecting our reactions. We're in a rethinking place anyway, with the Moon waning a bit more before Sunday's solar eclipse and Cancer New Moon. Take your time with decisions for the next couple of days. It's all systems go on Monday! The Gemini Moon brings out the storytellers, schmoozers and sales people. Gemini talks a good talk, Cancer may be convincing too, and Leo, Mercury takes over your sign at 12:39 pm. Mercury in Leo favors actors and other performers including those who work in the media for the next few weeks. Leo is the sign of children and teachers and summer camps! Plan for productive rehearsals, performances and other events. Tonight interesting people play a part and events may seem surprising. Wear yellow today. The Moon moves to Cancer at 7:38 am. There's solar eclipse tomorrow and this weekend will be a big turning point for some. Personal changes, relationship shifts, and new courses of direction are in the forecast and most of this will be unplanned! Eclipses rock our worlds and accelerate events. There's lots of planetary action so today may seem busy or possibly confusing. Mercury just moved to Leo and Venus slides out of the shiny sign of the Sun and into Virgo. Venus is more practical and less flirtatious in Virgo, solidifying and grounding love relationships, while also making us more critical of partners. It might seem like the honeymoon is over and time to deal with the day in and day out aspects of being a couple. Pisces may actually like this feeling of security and knowing what the expectations are. Taurus may feel like flirting, and Scorpio may suddenly be attracted to friend or friend of a good friend. Relationships are one of many things undergoing changes this summer! Note that the Cancer Moon today is sensitive to moods and surroundings and surround yourself with the best situations and people you can find! Wear silver today. The solar eclipse pairs with the New Moon, as always, at 3:40 pm EST. The Sun is in harmony with Mars and this is an energized, active, and unpredictable day! Solar eclipses tend to relate to fathers, boys and men in our lives and also to Leos. Changes are inevitable and include announcements, long distance moves or moves back home, and complete changes in our ways of thinking and operating. Most of this does not relate to planned or expected moves. Some of this will not be by choice. Circumstances and what some will call chance or fate are suddenly created. Even if things seem out of your control, your reactions and decisions are your own. Mars says move actively and with intention. The weeks ahead will be a chain reaction from this eclipse and the lunar eclipse in Capricorn two weeks ago. Cancer and Capricorn these changes are very personal to you. Wear white.